Finally got some clear weather, so took out my Celestron 1000/102mm refractor with Solarscope single stack 70mm filter attached to the front. Although I could get visual focus, I found I couldn’t focus the CCD camera with a 2 inch diagonal, so abandoned that and just fitted the CCD camera directly to the single stack blocking filter with a 2 to 1.25 inch adapter. I visually focused the scope first with a 30mm eyepiece until the sunspots were sharp then swopped in a 17mm eyepiece and focused (tuned) the hydrogen alpha etalon until I could see a rich field of fibrils. The etalon tuned after about 4 turns of its adjustment screw. After that the CCD went in. 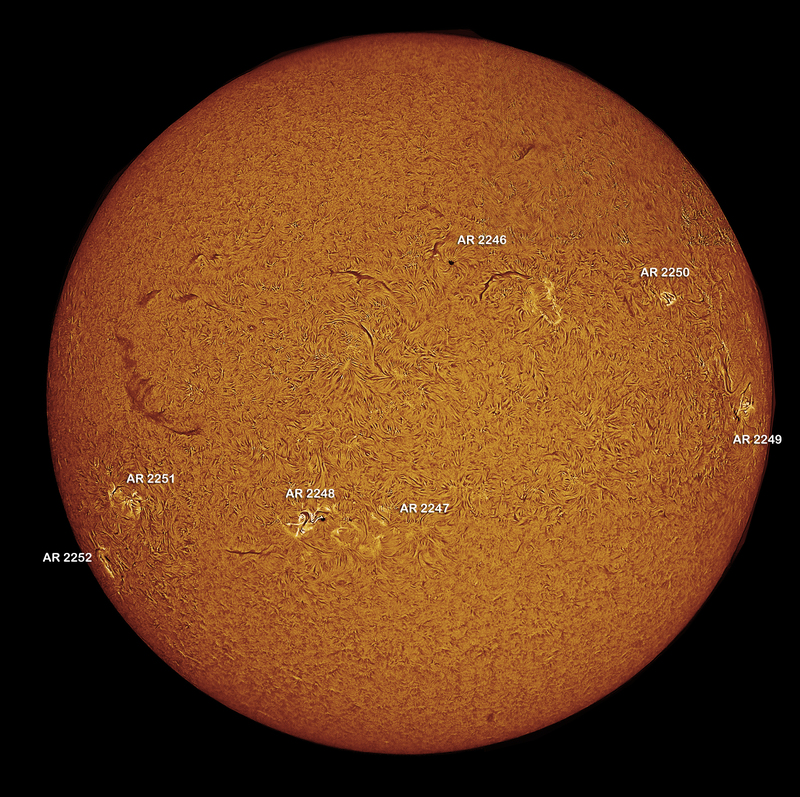 I was able to get about 9 mosaic panels of the Sun. Some of them were a bit dim especially around 12 o clock so the mosaic quality isnt great – really should have kept a tight eye on my histogram readings but overall am reasonably happy. Missed a jet flying across the Sun by a few seconds which would have been a nice image to have! 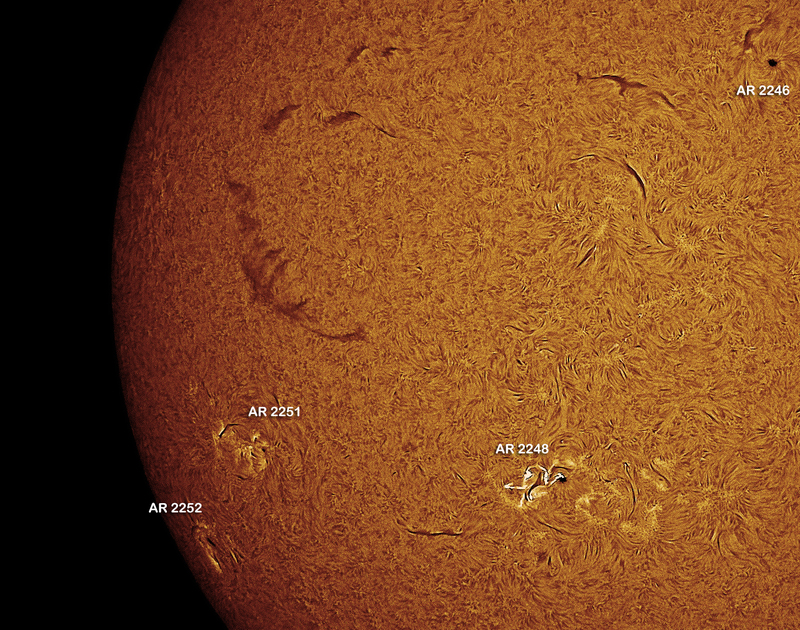 The top image shows a large quiescent filament at 10 o clock and there is a small C2.3 flare emerging from AR 2248 (checked this against daily solar events calendar at 1333 hrs UT). The weather has been awful for both day and night astronomy all month. My new double stacked hydrogen alpha filter system has arrived from Solar Scopes in the Isle of Man and I have modified a long Fraunhofer refractor to mount it. Got home just in time to see the low December Sun scraping above the trees. I set up quickly and used a Vixen NLV 30mm to see if I could reach focus and was rewarded with a red Sun with filaments and prominences visible and a bright active region. Ah well, at least I know I can focus. Might be a while yet before I get to image.